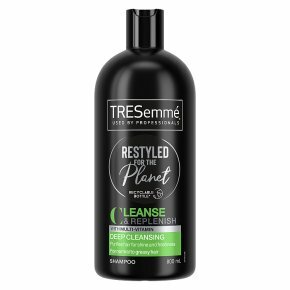 TRESemmé Cleanse & Replenish Deep Cleansing Shampoo gently removes build-up that diminishes hair shine. Washes hair of the residue from waxes, pomades, creams, sprays and more. Formula enriched with vitamin C. Gentle enough for daily use. Coat hair with a liberal amount of the clarifying shampoo and gently massage the scalp and roots with fingertips to work into a lather. Lightly squeeze the shampoo from roots to ends and rinse thoroughly, finish with TRESemmé Cleanse & Replenish Remoisturise Conditioner. Hair in need of a refresh? Treat your locks to a clean slate with the vitamin-enriched TRESemmé Cleanse & Replenish collection, the perfect gentle cleanse for that just-left-the-salon feeling. Why use deep cleansing shampoo? The professional quality formula of TRESemmé Deep Cleansing shampoo, infused with multi-vitamins, gently cleanses away build-up and impurities that can weigh the hair down and diminish its natural shine. Gentle enough for daily use, so you can reveal fresh, clean, purified hair every day. For all hair types, to get the look you want. Our experts' tips Gently apply Deep Cleansing TRESemmé Shampoo to wet hair starting from roots to ends Work into a lather and gently massage the scalp Then rinse thoroughly Follow with TRESemmé Remoisturise Conditioner Finally, style with your favourite TRESemmé products Our philosophy From our origins in Salons in 1948, TRESemmé has been driven by a simple truth: every woman deserves to look & feel fabulous, like they've just stepped out of the salon. TRESemmé is dedicated to creating haircare products that are salon quality. Inspired by stylists and tested in salons, the products are designed to help you achieve salon gorgeous hair every day. For more secrets from our professional stylists and details on TRESemmé styling appliances & tools, visit tresemme.co.uk Avoid contact with eyes. Can cause eye irritation. In case of contact with eyes, rinse thoroughly with water. TRESemmé ? Professional. At your fingertips.